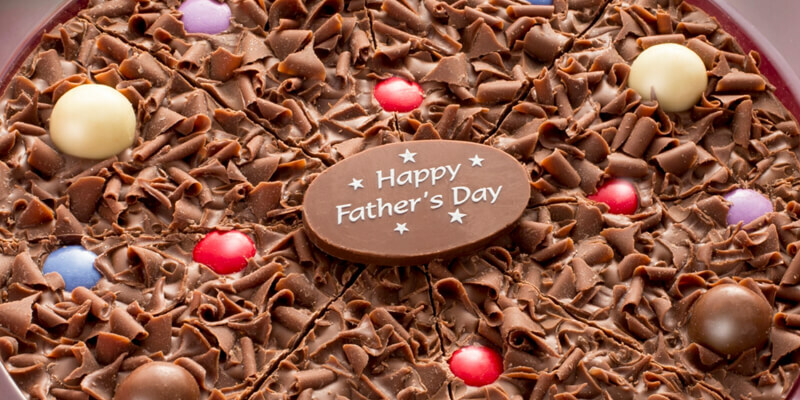 This year Father’s Day falls on Sunday 17th June, so why not give your father figure the recognition he deserves with one of our tasty chocolate treats? 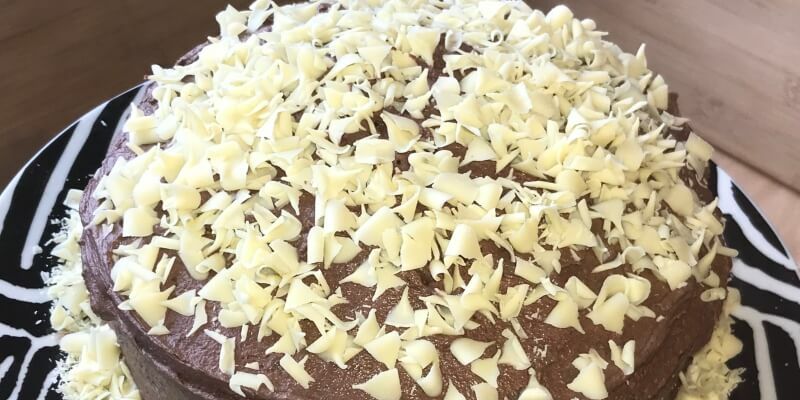 From our Father’s Day Chocolate Pizza through to our You Are A Star Chocolate Hamper, we offer a wide range of gifts that we think your Dad is sure to love, and you can choose the delivery method: click and collect directly from our site in Cotgrave, Nottinghamshire, standard delivery via Royal Mail in 2-3 days or Next and Named Day delivery options via a courier for orders placed before 2pm. An oldie but a good one – our personalised chocolate pizzas have been making our best-sellers list for several years now and quite rightly so. After all who wouldn’t want to see their own name or personalised message printed on an edible chocolate plaque. Great for 1st time Dads and Dad-to-be or just when you know exactly what you want to say! Of course, this had to make our top 10! 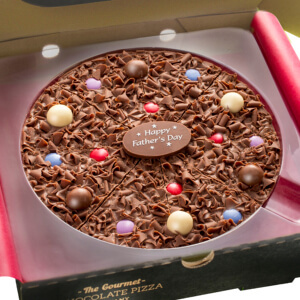 For those of you who are short of inspiration or just can’t get the words right let us say it for you with our ready-made Father’s Day Chocolate Pizza. 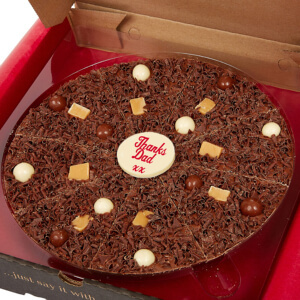 Featuring a luxury solid Belgian chocolate base, milk chocolate curls and a milk chocolate Happy Father’s Day plaque this pizza is sure to impress any hard-to-please Dad. If you’re anything like me, I’m sure you’ve asked your Dad to help you with a few DIY jobs over the last few years; whether it’s helping with a car or changing a lightbulb, Dads love to feel useful, so why not give him the recognition he deserves with a novelty trophy to adorn the mantelpiece, or to take pride of place in his garage or shed! Of course, the fun doesn’t stop there as we also include two of our best-selling chocolate pizza slices (Heavenly Honeycomb and Jelly Bean Jumble) along with a bag of our Chocolate Drizzled Popcorn. 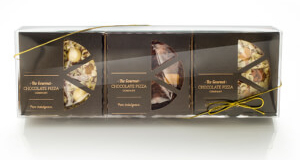 For the ultimate pizza lover, you can’t go wrong with our Chocolate Pizza Pyramid. Simply choose your flavours for each of the three different sizes of pizza and we’ll stack them into this beautiful pizza tower and finish it with a handtied bow for that extra wow-factor. 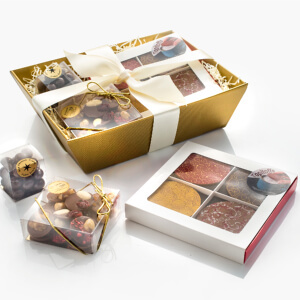 Next up, we have our Gourmet Chocolate Café Hamper – perfect for coffee-loving dads. 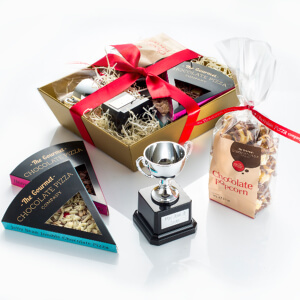 This golden gift hamper contains a box of our innovative Topitoffs (chocolate discs which sit on top of your favourite hot drinks), a box of Palet Gourmands (fruit & nut buttons for grown-ups!) and our Dark Chocolate Covered Coffee Beans, which are a perfect little pick me up treat at any time of the day or night. 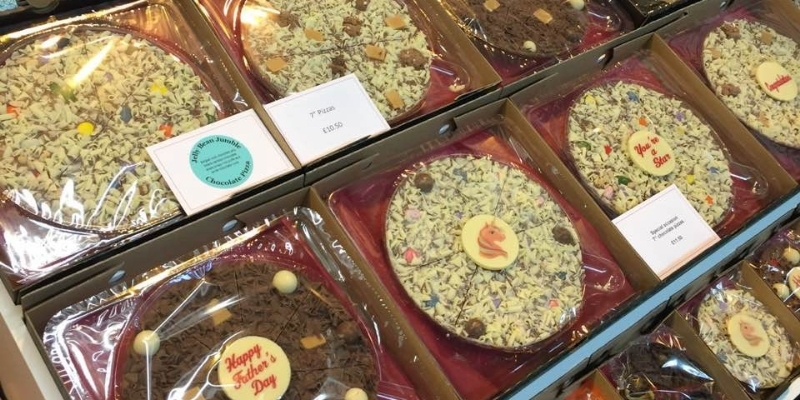 We know that Father’s Day can be expensive especially when there’s extended family members to consider, so if you’re looking for gifts for Granddads, Step-Father’s or even just a token treat for your own Papa then our Chocolate Pizza Slices could be just the ticket and cost under a fiver. 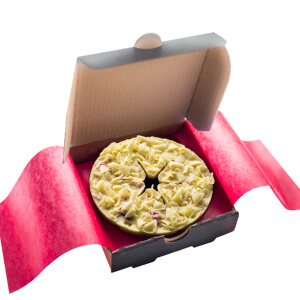 If you’d like to give your old man a variety of flavours to choose from but your budge won’t quite stretch to our Pizza Pyramid, then our Mini Pizza Giftpack is the ideal choice. This fun-filled gift includes three of our best-selling mini pizzas including Jelly Bean Jumble, Crunchy Munchy and Heavenly Honeycomb. 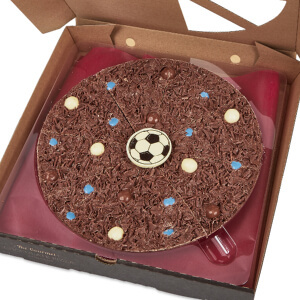 Perfect for footie-loving dads, our Football Chocolate Pizza can be customised to tie in with his favourite team’s colours. 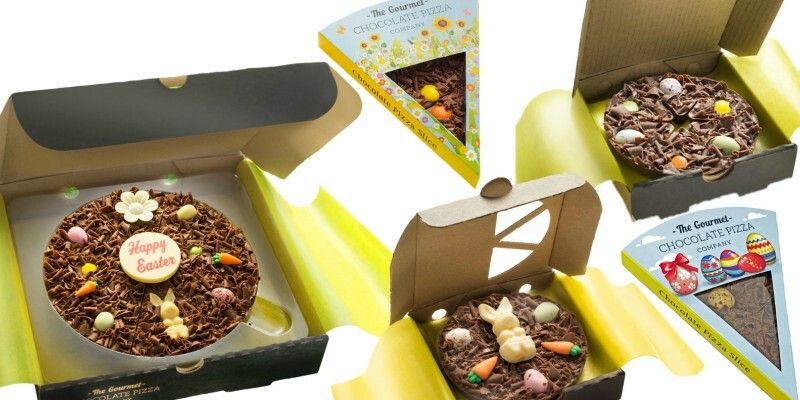 For the perfect token gift or top-up present for dad, our Mini Chocolate Pizzas make a great option. Choose from 15 delicious flavours and send the perfect gift for dad today! 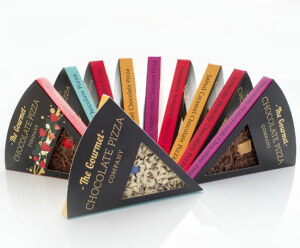 No list would be complete without our full selection of Gourmet Chocolate Pizzas. 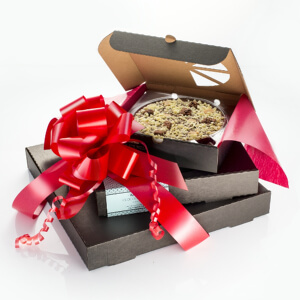 Choose from either white, milk and dark chocolate bases with to a variety of delicious toppings to really give your favourite fella a delicious gourmet gift. 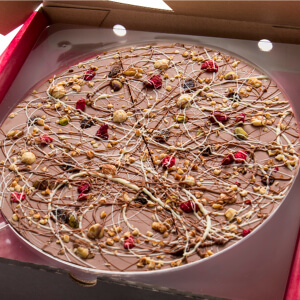 Of course, we love all our chocolate treats, but don’t just take our word for it… This year we teamed up with a number of bloggers to get you the real lowdown on our Father’s Day Chocolate Pizza.